It can be stressful watching your child handle rejection. While you want to be there to protect them, at this tween age, it is important that you give them the tools to handle social rejection on their own. Here are tips you can take to help your child handle rejection on their own. Social rejection can feel very painful to tweens, probably because it attacks some core psychological needs at this developmental stage. The initial pain of rejection often passes, however, once the child reflects on the situation, they may find it easier to manage. Help your child handle rejection by encouraging this self-reflection. First, prompt your child to consider who has done the rejecting: was it a true, long-time friend or simply a catty acquaintance? Secondly, encourage your tween to consider why the rejection happened: did your child legitimately do something wrong, or are his peers intentionally or maliciously singling your child out. The next steps will depend upon the specific answers to these questions. Regardless of those answers, though, the mere act of reflection can help move the child beyond the initial pain of ostracism into a healthier mental space. Because of the unique need for tweens to be socially accepted, they may form a sensitivity to disapproval that may be warranted. It is important to teach your child what constructive criticism looks like versus verbal abuse. Explain the importance of reading intent to harm or intent to help with your tween. Teach them to ask questions like, why did you say that, what do you mean by that, how are you trying to help me, etc. By teaching them to ask clarifying questions, they may be more understanding when constructive criticism is presented to them. Just the same, teach them what verbal abuse looks like such as mocking, public shaming and even silent treatment. By showing your child how to point out verbal bullying, they can choose their friends and associates better, and also learn to give constructive criticism. Social rejection may occur for catty, superficial reasons or for reasons unrelated to your particular child. Other times, however, your child's poor social skills may be to blame. If this is the case, you might focus on teaching your child to better read social cues- such as when a person is trying to end a conversation or when someone is too busy to talk. You might also encourage your child to avoid oversharing personal information and to become a better reflective listener. You can teach these behaviors by modeling them yourself. You can also point out instances when your child acts less than socially desirable, while simultaneously praising him for the times he behaves well. Most kids who have experienced ostracism will be quite open to these lessons. In fact, studies show that kids tend to become naturally hyper vigilant about social cues after being rejected. While physical wounds heal rather quickly, the psychological pain of social rejection can be long lasting. This occurs because psychological pain can feel fresh each time the rejection is mentally relived, according to psychological studies. Cues that relate to the rejection can encourage such mental reliving. As a result, they should be avoided whenever possible. For instance, if you know the peers who ostracized your child were big fans of a certain music group, you might avoid discussing that group or playing their music when your child's in the car. You might also be careful not to ask questions about friends who were mutual to both your child and the peer who did the rejecting. Of course, you cannot shield your child from all cues; if he was rejected at school, he'll almost certainly have to endure walking through those same doors every day. That said, each day that goes by and he's not further ostracized, the less the power of the rejection cues will be. Take time to consider whether your child is showing or has shown signs of depression or other socially disordered behavior. If you're unsure, consult a mental health professional, and schedule a counseling session if there is cause for concern. 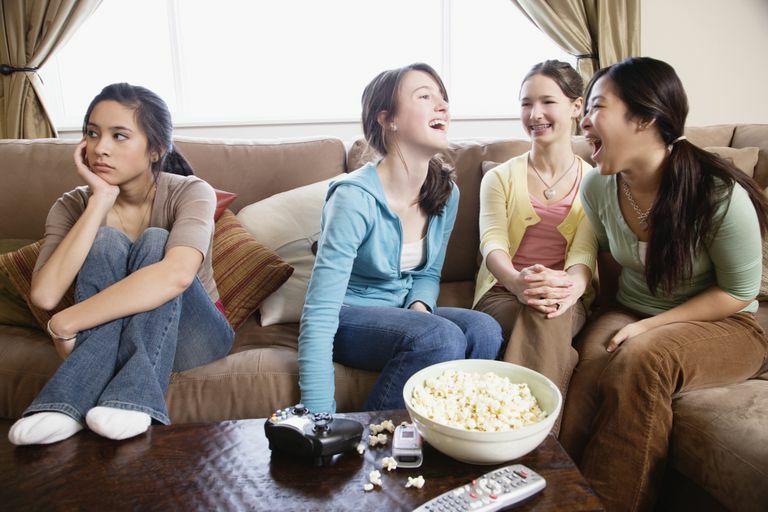 If needed, a professional can help your tween change the way she processes social rejection. As a result, your child may be less likely to relive the pain of ostracism repeatedly. Also find ways to support your child's positive social development by supporting their aspirations to do certain things socially, like attending events with friends, taking up a new dance class, or learning to play music. The most important thing to remember is to be present and available to your child during this sensitive time in their development. If you can keep them talking, you've won half the battle. Williams, Kipling D., and Nida, Steve A. Ostracism: Consequences and Coping. Current Directions in Psychological Science. 2011. 20(2): 71-75.